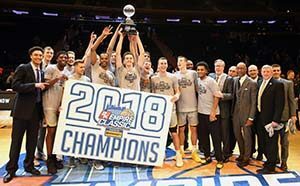 Iowa led for virtually the entire game and by as 25 points in earning the 2018 2K Empire Classic benefiting Wounded Warrior Project title with a 91-72 win over UConn at Madison Square Garden. Luka Garza scored 22 points and pulled down seven rebounds in claiming the tournament MVP award. Tyler Cook led all scorers with 26 points to go with eight rebounds to earn a spot on the all-tournament team. Connor McCaffery tallied 19 points and handed out five assists. As a team, the Hawkeyes shot 29-of-57 from the field and 29-of-37 from the line. Iowa also outrebounded UConn 43-31, resulting in 20 second chance points. The Huskies were paced by Jalen Adams and his 20 points. Eric Cobb, who was named to the all-tournament team, had 16 points and seven rebounds, Alterique Gilbert netted 12 points, and Christian Vital added 10 points. In the consolation game, No. 13 Oregon limited No. 15 Syracuse to just 18-of-51 shooting from the field and 5-of-28 from three in posting an 80-65 win. Bol Bol earned all-tournament honors with his 26-point, nine-rebound performance from the Ducks. Oregon also received 18 points from Payton Pritchard and 12 points and six rebounds from Kenny Wooten. The Orange were paced by Tyus Battle and his 17 points. Jalen Carey, who garnered all-tournament acclaim, netted 14 points, as did Elijah Howard. Oshae Brissett scored 11 points and had six rebounds. In the Subregional semifinals at Eastern Washington, Green Bay and Morehead State advanced to Saturday’s championship game. A.J. Hicks scored 28 points and Jordan Walker tallied 23 points to lead Morehead State to a 99-89 win over UMKC. Lamontray Harris added 11 points and 13 rebounds. The Roos were paced by Xavier Bishop and his 23 points and six assists. In the nightcap, JayQuann McCloud tallied 21 points, ShanQuann Hemphill had 19 points, and Cody Schwartz posted 18 points and nine rebounds as the Phoenix took an 82-78 overtime decision from the host Eagles. Eastern Washington received a team-high 15 points from Jesse Hunt. Green Bay and Morehead State will meet for the title on Saturday, while Eastern Washington ans UMKC will play in the consolation match.